Where is Planet X now, on its approach to Passage? Planet X's Orbit through the solar system in early 2003 was from the direction of Orion, in a Retrograde orbit. It also dove 32 Degrees below the Ecliptic during its approach, but rises prepatory to crossing at the Passage. What are the signs that this point has arrived? 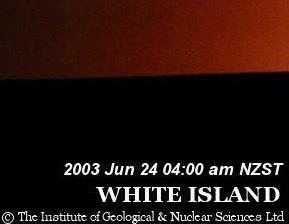 The massive Global Quakes on June 20 2003 and June 23 2003 signaled some change. 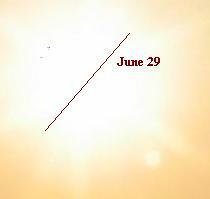 From Photos, it seems the true physical location, is below the Ecliptic on June 26-29 2003. 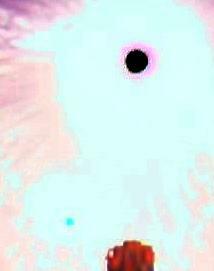 Serious government coverup of earth changes started by June 22 2003, and at this time, June 28 2003, the White Persona was seen to the right of the Sun. As Earth continued in its orbit, and Planet X in its retrograde orbit, they came closer, Planet X appearing brighter, larger and moving in a retrograde orbit between July 6-14 2003. The Solar Wind blew the tail of Planet X toward Earth, visible as an explosive red sunburst by July 9 2003, and red dust increased. 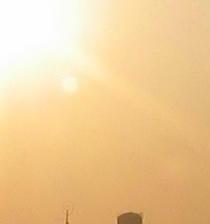 By July 15 2003 the dust cloud was drawn increasingly toward Earth. 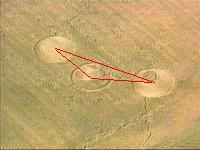 A Wisconsin crop circle included the exact ZetaTalk triangle, and others inferred an aborted solstice and the appearance of a Winged Globe. 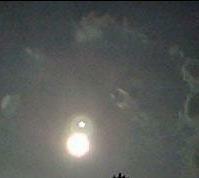 The Winged Globe appeared on Aug 16 2003. 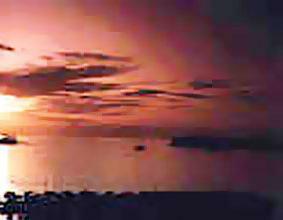 Ancient Jewish and Chinese holidays anticipate a Fall cataclysm, and photos showing Planet X rounding the Sun at an angle similar to a key crop circle. Neither planet can proceed further in their orbits now, without losing the Point of Passage midway between the Earth and Sun described by the Zetas. Earths orbit may slow, in the magnetic grip, as well as rotation slow to a stop. The drama may be about to begin. [Planet X] slows to a floating rate so that it floats past the Earth during the week of rotation stoppage, which is the point it is also floating past the Sun ... Planet X will be millions of miles from the Earth, not quite halfway between the Earth and Sun. Thus [Planet X] will come into the Earth's orbital plane not directly between the Earth and the Sun, but forward, somewhat closer to [Planet Xs] approach. When one is looking toward Orion, at this time, from above the Earth's orbital plane, the Earth, Sun, and [Planet X] will thus form a triangle in the Earth's orbital plane with a 23 degree angle at the Earth, an 18 degree angle at the Sun, and a 139 degree angle at [Planet X]. 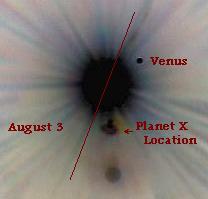 It is at this point, essentially, that [Planet X] is closest to the Earth. Magnetic fields are such that at a distance, with other influences affecting the magnetized body, the status quo prevails. But when the fields engage to the degree that the lesser body's ability to resist is overcome, then suddenly there are changes. One day and the next Planet X appears the same size, the tail and moons visible in the same manner, but rotation has slowed to a stop!  The dot in the center of the Suns in the photos above is caused by a light overexposure in the camera. 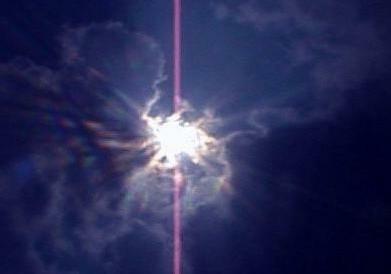 This has appeared only recently due to the light coming from both the Sun and Planet X. 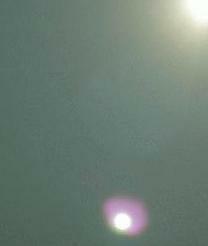 The increased brightness can be seen in these Vancouver images, the one taken after the Summer Solstice brighter where it should be fading, demonstrating that Planet X is coming closer. 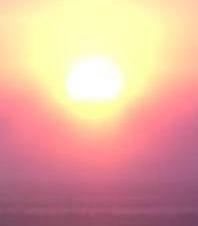 This extra light has also caused crops to mature two weeks early, around the globe. I am a farmer in Illinois. 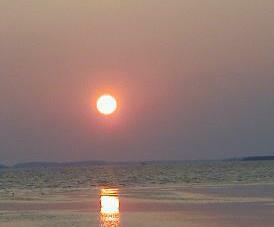 Many of my friends have been commenting on how unusually bright the sun has been this summer. I have noticed this as well. Despite a relatively cool growing season so far, our crops are well advanced for this time of year. ... The cherry crop matured about two weeks early here in Northern Utah. Rising from the south, where the Atlantic Rift was accessible from all sides by Planet X as it could reach under the globe like a hand with its magnetic field, Global Quakes were evenly distributed at all four grip points as the reach allowed this. During the period of the massive Global Quakes on June 20 and June 23, this changed to be either held in position when the Atlantic Rift lined up with the core of the Earth, at the Face and Dark placement points, or to to grab and pull the Atlantic Rift into alignment at the Dawn and Dusk positions.. The Stage is Set for rotation slowing and stoppage. Points where the Atlantic Rift is gripped by Planet X are when it faces Planet X, is escaping from view at the Atlantic Rift dusk, is opposite on the dark side of the globe, or presenting again at dawn. 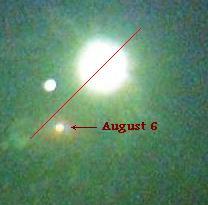 The movement from the right of the Sun toward the left can be seen by the UTC times when significant quake bursts occur. During this time, the White Persona, which represents the true physical placement of Planet X, has migrated dramatically from right to left in the photos! 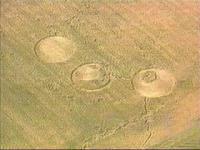 On July 4 2003 a Crop Circle appeared in a barley field near Horicon Marsh, WI. 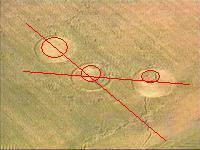 The exact triangle described by the Zetas for Planet X entry into the Ecliptic is present, showing this crop circle was intended to relate to ZetaTalk. The relative size of Planet X, as seen by the human eye, is shown with the rightmost circle shows size prior to July 4, the center by mid-July, and the leftmost circle the size to be anticipated. Planet X placement on the Ecliptic, where supplanting of the Sun's magnetic influence over Earth will cause rotation stoppage and the shift, is shown by the lines, where the rightmost circle shows no blockage, the center partial blockage, and the leftmost total blockage. Dates could potentially be inferred from this crop circle. The USAF Visited this site after this relationship was posted on the web. 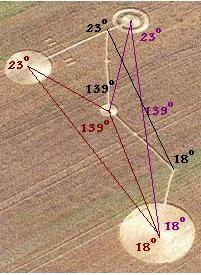 A second July 4 ZetaTalk Triangle circle also was belately discovered. August 2 Eastfield/Southfield reference to Solstice with Quake/Pole occurrence and September Days.